I'm re-publishing this particular post for a link up with Kelly's Korner Blog. Today's link up is for parents with special needs kids. It is my heartfelt prayer that it may encourage someone else reading today. I send you much love! If you've read my blog at all, you may have seen the "About Me" section on the sidebar. It says that I'm married to a pastor, but don't have a perfect life. (Who does, right?) But I wanted to share a little bit more about myself and why I had wanted to share those particular words. We have had had seven children. Our second son passed away when he was four, due to respiratory complications associated with cerebral palsy. His twin sister is now 22 years old. She too has cerebral palsy and is in a wheelchair. Our youngest child, who is 8 yrs. old, has a rare, genetic disorder which requires him to have a g-tube to help with his nutrition and medications. Other than being very thin, he is a normal, happy-go-lucky little boy who loves NFL football and NBA basketball. Even though I am married to a pastor and have a personal belief that God still heals today, I find myself in this situation with the health of my own children. I have shared before that I have struggled with despair and doubt, but ultimately, my faith rests in the character of God. I know Him, and I have experienced His kindness and beautiful mercy in my life. Have my personal faith struggles ceased? No! I would never mislead you that I have it all together and have this heartache all figured out. Can I share an example with you? Just a few weeks ago, I stood in a hospital room with my husband to visit a baby in our congregation. My heart was so heavy as we stood in the room. He was just the most beautiful little baby who was born with serious, life threatening medical issues. We gathered around to pray for him and as I earnestly prayed for his healing, I was suddenly bombarded with this thought..."Will God heal this child, but not mine?" I pushed that thought out of my mind, but it came back with a vengeance. "Will God heal their child, but not yours?" Inside my heart, I had to stand back a moment to try and answer that question. I hope that you believe me when I say that with all my heart, I was (and am) praying for this baby to be made totally well. But, what if he was healed? And what if I went home to my daughter who still sits in her wheelchair - unchanged. What then? This terrible pain seemed to settle on me. I didn't know the answer to the "What then?" except that I would have to walk it out. There just wouldn't be a way around it. There would be rejoicing in my heart for someone else's child, but it would coexist with pain for my child. I have to keep coming back to this one thing. When I strip everything else away, and I just look at Jesus, my heart is comforted. He has made Himself very real to me, particularly in the last four years. I used to try my best to know Jesus, but it seemed I kept running up against a religious figure. My reference point to Him was more or less at the point of my salvation experience. That just isn't enough. He needs to become a real, living person to us who walks with us and holds our hand through every experience of our life. I know this very well, that over the times in my life, when I felt truly alone, He became a powerful presence that comforted me and stayed with me. I know that I can trust Him. A couple of weeks ago during the worship service at our church, people came up front who needed prayer. I usually don't go and pray for people unless they ask me to. Part of the reason, to be extremely honest, is I wonder if my prayers may be a little faulty. I've laid my hands on my daughter and prayed with all the faith I have, but haven't seen any changes at all. But as I sat with my little boy, I suddenly saw such a clear picture in my mind. I saw Jesus walking among the people and so joyfully touching them. I can't emphasize enough the word "joyfully". He would throw His head back and laugh with joy. Sometimes I get pictures like that and I am always surprised that this would happen with me. I just seem like an unlikely person to have these experiences. But that image has stayed with me for days now. On that same morning, a little eight year old girl also shared before the congregation that she felt God was saying that this was a day of joy! She had no way of knowing what I had just experienced and seen. I think I know why He wanted to show this to me. Here is the best way I can explain this whole situation. Sometimes it seems that in front of me is this very ugly curtain. I've seen it so many times that I know what it looks like by heart. I think the curtain represents very real situations that I've cried over and prayed over, but have seen no tangible answers. But then God suddenly lifted up this drab curtain and lets me see what is behind it...and it is beautiful! What I see or think is oftentimes incorrect. It is filled with pain and questions. But then for a moment, I see a glimpse of what is real - what is on the other side of that curtain. I see Jesus as He really is. He is there with great joy. He is there with great joy beside me. Does this description of this curtain that make sense or resonate with you? Maybe you have sensed the same thing. So, I guess my answer lies in this. I can completely trust Him. I may not always understand, but I know that He is very acquainted with me, my thoughts and my ways, my fears and my dreams. I am not anything special because I have children with special needs. I really don't like it when people imply that. It makes me uncomfortable. Sometimes I am a really good mom, and other times I really stink at it. I often feel exhausted and can cry at the drop of a hat. Other times, it's like, I can do this today!" God gives me strength when I need it and at other times, I think He is just like, "You need to cry a little bit today. It's okay. I'm not busy. I'll sit here with you while you cry." Sometimes I just have days where I see once again that a dream I have had for my daughter will not come to pass - at least, not as far as I can see today. 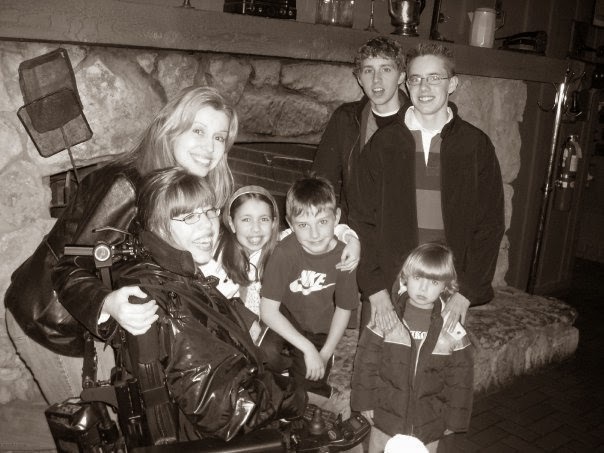 It is a gut wrenching pain that is just as fresh as when I first heard the words in a neurologist's office, "Both of your children have cerebral palsy." I don't think the pain of those words ever completely go away. But I have found that joy can coincide alongside pain. Many things about tomorrow. I don't seem to understand. But I know Who holds tomorrow and I know Who holds my hand. I have good days and bad days, but I think the bad days are giving in more and more to good days. Sometimes, there are days when I feel like all my hope is gone and I need to just settle it that there won't be any miracles for me or my kids. But then, the tiniest little flame of hope will burst forth once again. It isn't much, but it's there. It begins to glow and become stronger. If you are going through a crisis of faith, or a dark time with your spouse or children, let me encourage you as someone who is also in the middle of a long war that I wish was over. (By "over", I mean that I want to see my daughter walking and my son totally healed.) Jesus is there beside you with great joy over you. He understands the hurts and questions of your heart. Even if it doesn't feel like He is with you, He is. In His presence is fulness of joy. Let Him fill you with joy even though your circumstances seem to remain unchanged. Ask Him to show you that He is there. He will. Kathy, your words Blessed me so today and encouraged my heart! So beautifully written! Thank you! Wow. You have put this together so beautifully, and it resonates so true and clear. It literally made me choke up a bit, thank you for sharing this! I think it's going to help a lot of people in similar struggles. I could almost see the sparkle in your eye, describing the joy of the Lord, and what's behind the curtain.. you are a blessing! It has given me things to ponder for sure.. Thank you, Marti. I hope it does help. Thanks so much for writing! Thank you, Stacey. Your words really encouraged me! Thank you so much, Gloria! You are always so kind. Thank you so much for sharing. I was very inspired and I feel like you gave some good advice on how to deal with difficult realities in our lives. You are awesome! I so needed this today, Thank you for sharing honestly. Thank you so much, Marty! I would really appreciate your prayers. Hugs to you! With tears flowing, I thank you for reminding me I have not been forgotten or overlooked. You haven't been - thank you, too, for writing! Kathy, I am inspired by your beautiful faithfulness. You make it plain that Jesus is joy to you when you are in the low place and hope is weak and faith fades into despair. Thank you for sharing this reminder that we are not alone. Hi, Kathy. I am printing this beautiful post, to read and re-read often. Your openness as you "teach" through your sharing is such an inspiration. Thank you. Sweet Kathy, thank you so much for writing this from your heart!! I appreciate your honesty more than I can say. You are a blessing to me! As I read this my heart breaks but then when I look at the picture of your family.......I see the same joy that you saw in Jesus. Keep your focus. I know you are heartbroken and I can't imagine your pain and don't ever want to but, I do see the joy there. We are human. YOU are more than merely human. YOU have a gift and to those that have more, more is expected. You are a blessing in the lives of so many. I see that. Your reward will be tenfold and you will laugh and dance with your family in your only true home, heaven. WOW! Honest. Beautiful thoughts. Hurting thoughts. So eloquently put to words. We don't often allow our Christian believing friends to get gut-level honest...and when we do, we see ourselves in their words. Thank you for sharing your heart and hurts. I loved this post and I wouldn't have seen it had you not been kind enough to come to my blog and leave a comment today, so thank you! I have to tell you that reading your post, and knowing that you are a Pastor's wife yet still deal with the same emotions and concerns that I have...I don't know why but I was encouraged. Not that I thought Pastor's wives were immune to such feelings, they are just not often shared. Thank you for sharing your heart through this post! Thank you for sharing your honest thoughts and feelings in this post. You probably have encouraged more people than you realize. My Dad was a pastor so I was always at church and brought up to believe that everything is possible with God. I still believe that is true but sometimes I am ashamed to say that my faith is weak. Our first daughter died at the age of 7 months. Our second daughter has had health issues since her birth. Doctors do not have a specific diagnosis for her almost constant body pain and other symptoms. I often think how easy it would be for God to heal her since he could. I have prayed for many years for her with no change in her condition. It is so hard for me to understand how allowing her to be this way could possibly be His will. She is a Christian and a very decent person. So, I understand how you feel about your children. I know things will be wonderful in heaven but I selfishly want a good life for my child now. I sometimes feel like such a failure as a mother and a Christian but I won't give up hoping and praying for even partial healing for her. I will also remember to pray for you and your family. You seem like a wonderful person who loves her family and God very much. Thank you for sharing and allowing a whiner like me to sound off. I was really touched by your note. I don't think this is God's will, though sometimes it can feel that way. There isn't anything selfish about wanting a good life for your child now, and you aren't a failure as a wife or Christian because you haven't seen an answer to your prayers yet. I struggle with those same thoughts at times. I'm praying for God to show you very personally how He is there in your lives today and how tenderly He is caring for you both-supernaturally. I send lots of love to your family! Found this thru the link up at Kelly's Korner. My 3 1/2 year old son Drew has Spastic Quad Cerebral Palsy. He is the light of1Z869V6RYW59103984 my life. Your post reasonated deep within me. I sometimes struggle and wonder why Jesus doesn't heal him. But he is so happy, an absolute joy, and I know the Lord is using him and our story in so many ways. God bless you.